eSSential LMS Bundles | Why Buy an LMS Without E-learning Content? An LMs, authoring tool, and editable content...all in one place! Why buy an LMS without content? And, why buy an LMS with content and have a separate authoring tool? eLogic offers editable content bundles from industry-leading providers that can help increase the knowledge and skill sets of your users. Yes, the content can be edited to use your verbiage, branding, images, logo, and more! Plus, with our native integration with the dominKnow | ONE authoring tool, editing these courses just got even easier! It’s as simple as hitting one button to upload the course into eSSential LMS. Click on the “find out more” button below each option to see a detailed course library for each bundle. With each of the eSSential LMS bundles, new LMS clients will receive a course designed just for their organization by our expert Learning Solutions team. Our e-learning solutions are always aligned to clients’ overall business development strategy to achieve meaningful outcomes. The course can be up to one hour long and is guaranteed to get your message and learning objectives across to your learners. Our team is experienced in a variety of e-learning formats, including mLearning, video and more. Partner with us for new hire onboarding solutions, regulatory compliance training or any other training needs you have. The completed course will be fully compatible with the eSSential LMS, allowing you to track course performance, follow up with learners and report on your specific training KPIs from a single system. 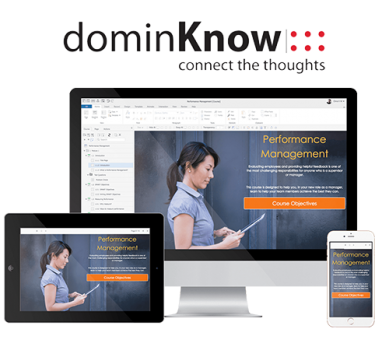 eLogic Learning has partnered with dominKnow to make the dominKnow | ONE tools available in the eSSential LMS at no additional charge for qualified new LMS clients. 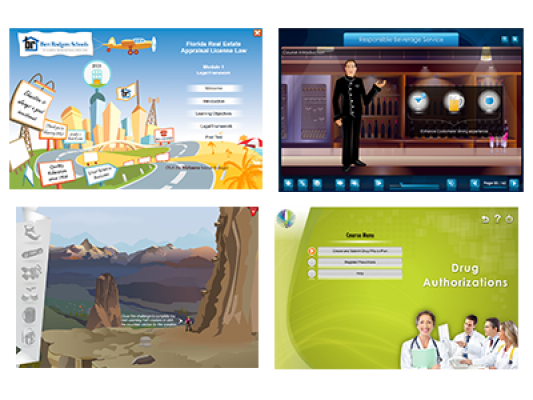 dominKnow | ONE all-in-one cloud-based eLearning authoring tools are designed to optimize creating and building more kinds of digital learning experiences with fewer tools, managing content centrally, reusing assets, and collaborating as a team.